From the minute you step in the door you'll be oh so glad you left your cares and worries at home. 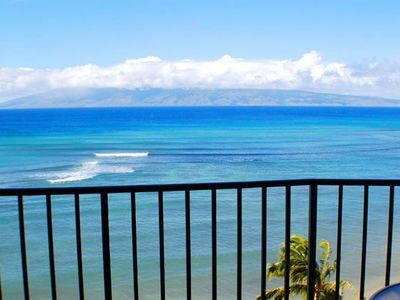 The view of Molokai and Lanai across the shimmering ocean is truly magnificent. 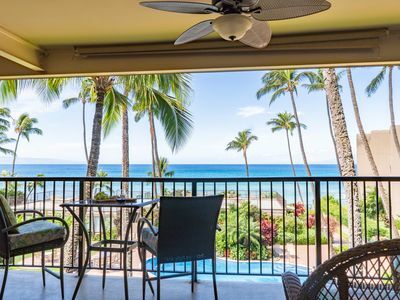 From your lanai you've got a front row seat for whale watching (Nov-Mar). The wind and kite surfers put on an amazing show right in front of you when the waves/winds are to their liking. The vibrant rainbows over the ocean are truly breath-taking and the nightly sunsets are so spectacular they'll give you 'chicken skin' !! What could get better than this? 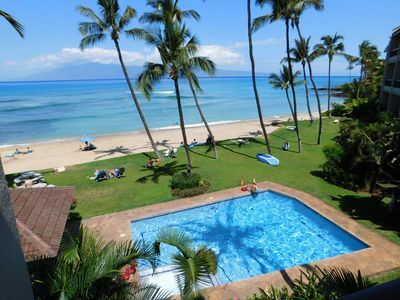 Kahana Beach, a wide sandy beach, is located right below you just steps away. It's a great beach for both swimming and snorkeling and extends in both directions for a leisurely early morning, mid-day or sunset stroll. 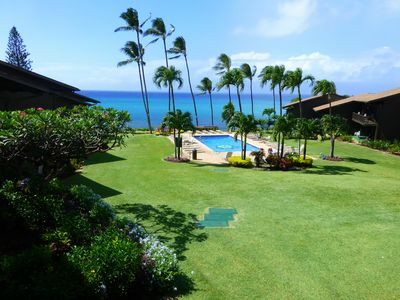 You may even see some large sea turtles or occasionally a monk seal who has come by to visit. 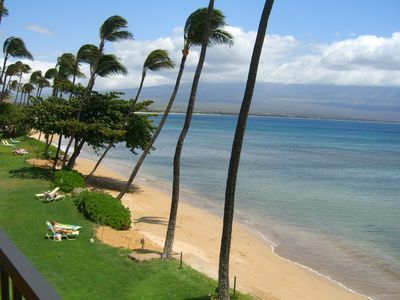 Other sandy beaches such as Kaanapali, Kapalua and Napili are just a short drive away. Beach towels are provided for your convenience. 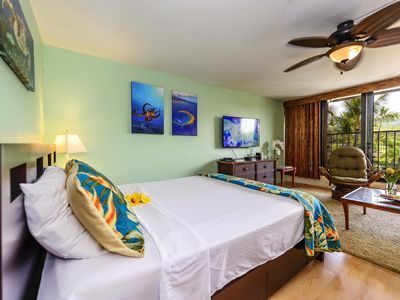 Your Maui studio apartment has a fully equipped kitchen and you may also want to take advantage of the BBQ, tables and chairs down by the pool. There's a comfy queen sized bed, as well as a queen sized sofa bed, and the unit will sleep four people. For your enjoyment there's also a TV, DVD player and a Bose Wave Music System with AM/FM and a CD player. Also for your convenience we have wi-fi Internet connection in the unit. Laundry facilities are available on the third floor behind the elevator. Trash chutes are also located behind the elevator on each floor. 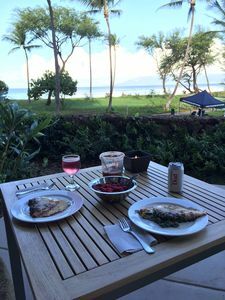 For 'wining and dining' there are several good restaurants within a short walking distance: Sands Of Kahana Restaurant next door and Dollies Cafe & Pub across the street. Black Angus Steak House, Fish & Game, Roy's and McDonalds are all in the Kahana Gateway Center, a block away. 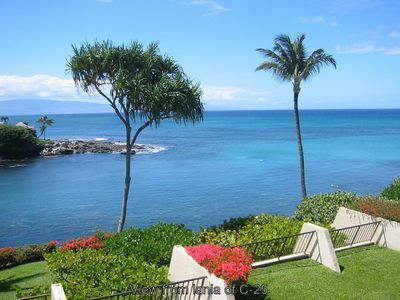 The Ritz Carleton Hotel at Kapalua and the various hotels in Kaanapali (both about a 5 min. 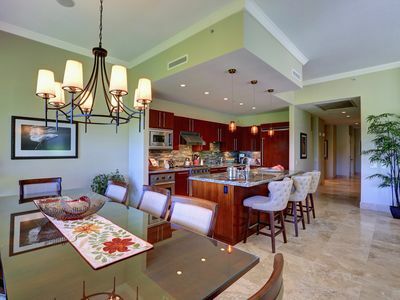 drive away) offer even more dining and a variety of retail shops. 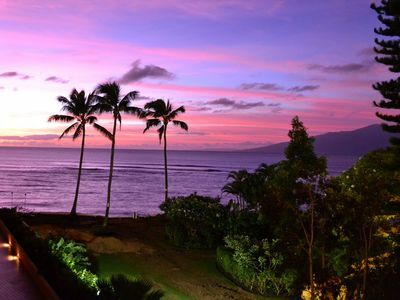 Be sure and spend some time in downtown Lahaina with it's fun Front Street shops and many restaurants. 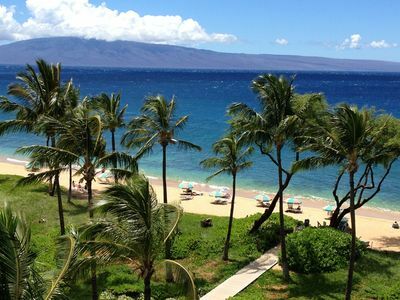 Don't forget your parasailing adventure, a snorkel or sunset ride on a catamaran, a trip to Hana, the silver swords at Haleakela and the many other choices of things to do on Maui. 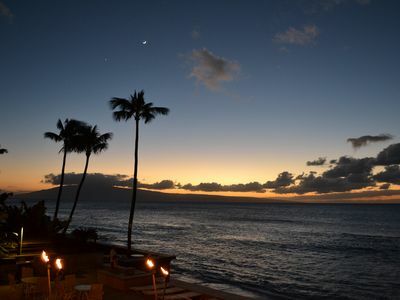 After a fun-filled day, a gorgeous sunset from your lanai and a full tummy, you'll find yourself drifting off to dreamland to the lull of the waves and the soft breezes of the Maui trade winds .. all in preparation for the next day of exciting things to come. 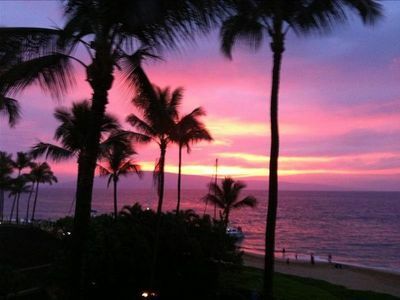 Remember, MAUI NO KA OI .. Maui Is The Best !! 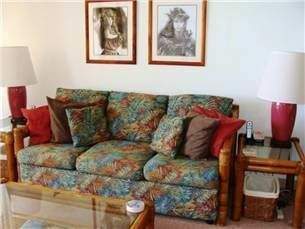 Thank you for choosing our Maui condo for your special Hawaiian Vacation! 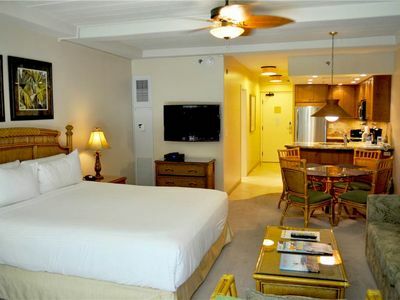 Keywords: condo; Valley Isle Resort; studio apt. 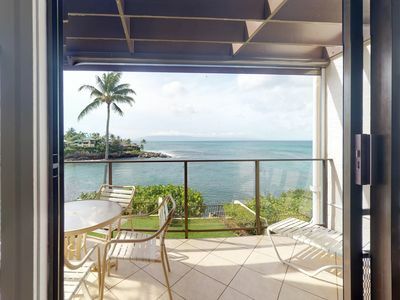 ; West Maui; Kahana; oceanfront; beachfront; ocean; water; sunsets; rainbows; whales; turtles; snorkeling; clouds; blue sky; sky; trade winds; blue; condominium; vacation rental; Maui; Hawaii; condominium rentals; sleep 4; ocean views; beach; swimming; scuba diving; snorkeling; coral; fishing; jogging. 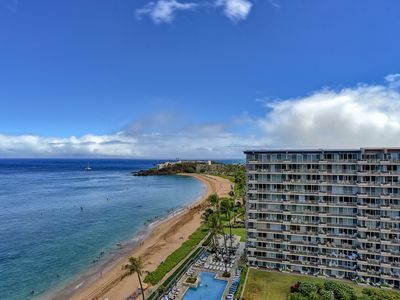 Fantastic View Like Ocean Front Whaler Luxury Unit! 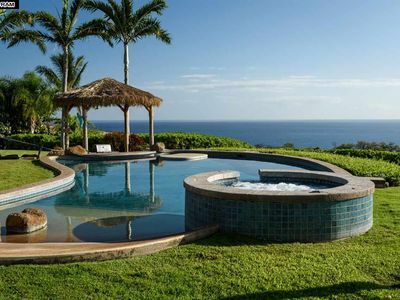 The Maui Vacation Experience of a Lifetime! Tired of the Cold? Time to defrost in 80 degree weather! 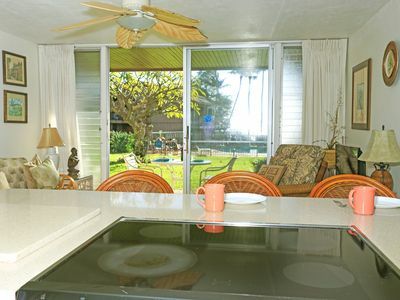 Ocean FRONT premium studio $1,850/weekly rental. 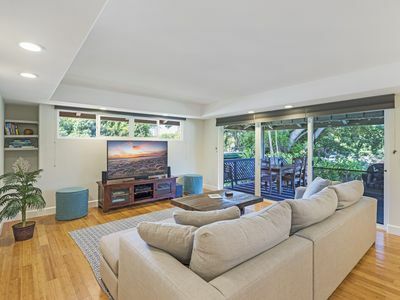 Kaleialoha 402 A Studio by the Sea, Walk to Beaches, Shops!